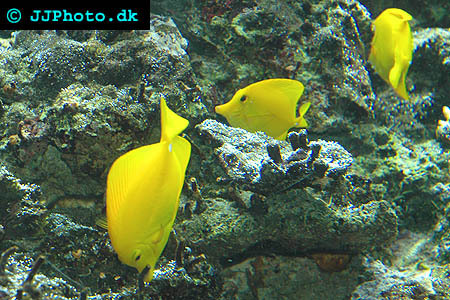 Company: Zebrasoma flavescens (Yellow tang) is best kept with small fishes. Aquarium Setup: Zebrasoma flavescens (Yellow tang) needs a lot of space, preferably at least sixty gallons, and strong water movements. Place plenty of live rock in the aquarium to provide algae and places for hiding and sleeping. Yellow tangs must have many hiding spots to feel good. Acropolis coral skeletons are well-liked. pH should be 8.0-8.4 and temperatures should be kept in the mid-seventies or the low eighties F. Strong aeration is vital. Food: Zebrasoma flavescens (Yellow tang) eats mainly Filamentous algae. A suitable aquarium diet includes meaty and vegetable materials, in very small amounts. Yellow tang can store fat in their body cavities, and it is natural for them to go through periods of non-feeding. 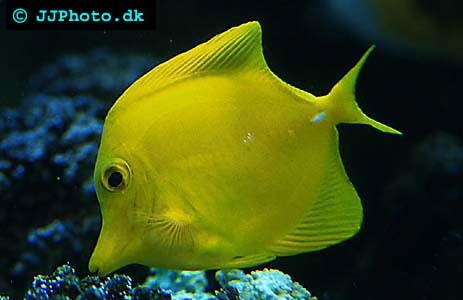 Breeding: We are unable to provide any information about how to breed Zebrasoma flavescens (Yellow tang) in the wild.